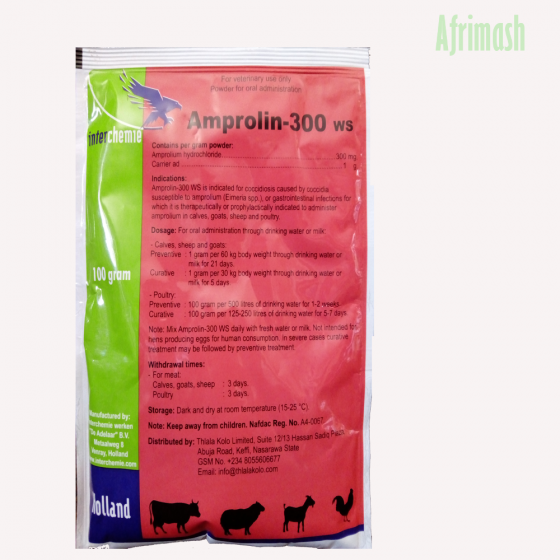 Amprolin is indicated for the treatment of coccidiosis caused by coccidia susceptible to amprolium (Eimeria spp) or gastrointestinal infections for which it is therapeutically or prophylactically indicated to administer amprolium in calves, goats, sheep, and poultry. Preventive; 1g per 60kg body weight through drinking water for 1-2 weeks. Curative; 1g per 30kg body weight through drinking water for 5 days. Preventive; 100g per 500 litres of water for 1-2 weeks. Curative; 100g per 150-250 litres of water for 5-7 days. NOT INTENDED FOR BIRDS PRODUCING EGGS FOR HUMAN CONSUMPTION.